Audatex announces total-loss predicting, shop-matching ‘AudaFNOL’ in U.K. The United Kingdom branch of Audatex last month announced an “innovative, all-encompassing, next generation” first notice of loss system able to predict total losses at the scene and dispatch repairable cars to an appropriate insurance network shop. The AudaFNOL product announced Oct. 24 by Audatex U.K. and at Connected Claims Europe is designated for Great Britain, but a spokesman for Audatex U.S. didn’t rule out the system coming to America. “The team is working through the localization of this technology but are not ready yet to release information,” spokesman Morgan Butler wrote in an email Monday. He suggested more information might be available next year. The system appears to largely rely upon photos taken by the customer following the crash, which receive desk review from an adjuster — and an artificial intelligence. Audatex noted that the customer might have a more interactive role than simply taking the photos. 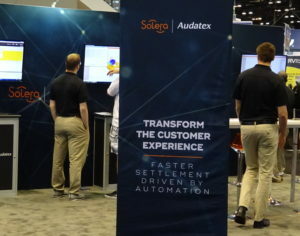 “Using Audatex’s software, the policyholder or the claims handler can then mark up the area and severity of the vehicle’s damage witheither a 2D Damage Capture portal or a downloadable 3D Damage Capture app that provides a gamified representation of the exact damage to the vehicle,” Audatex wrote. The software then runs the vehicle through a predictive analytics “Repair vs. Total Loss feature,” according to the British branch of the IP. The system classifies the vehicle damage “based on millions of vehicle damage assessments,” which is probably a reference to a historic record of photos associated with estimates. CCC and Mitchell both have announced plans to have an AI make total loss determinations using similar data sets. Audatex said repairable vehicles can be dispatched to the shop which best fits the conditions of the wreck and customer. While shop choice laws in many states prevent insurers from selecting a repairer outright or “steering” to a network shop, the technology might still have a role in helping shops and insurers load-level at an MSO or DRP network in a particular market. It also seems like a means of ensuring a certified shop gets the work rather than whomever happens to be No. 1 in the DRP KPI rankings. However, Audatex argued that having access to the AudaFNOL data also allows the shop to impress the customer — an interesting point and a hopefully a good predictor of insurer cooperation when it comes to a shop obtaining AI and FNOL data available to the carrier. “Allowing the bodyshop visibility of the images before speaking to the customer enables a smoother and improved customer experience, with additional familiarity of the vehicle and customer’s needs,” Audatex wrote. Whether AudaFNOL makes it over to the U.S. or not, such “insurtech” seems likely to start changing the claims game for collision repairers and auto insurers sometime next year. Shops are going to have to be ready to adapt to the benefits and headaches accompanying such systems to stay competitive. A crucial step — particularly in the case of non-DRP facilities — will be to be kept in the loop on the trove of data and photos already available to the customer and insurer before the vehicle even arrives at the shop, just as a specialist might request the medical records from a referring general practitioner.